Intel PRO/Wireless 2200BG/2915ABG Driver 1.1.0 for Linux. 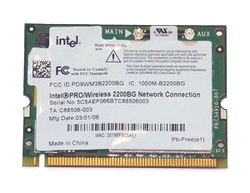 This is a unified driver for the Intel PRO/Wireless 2200BG Network Connection and Intel PRO/Wireless 2915ABG Network Connection. These adapters are found in notebook computers with Intel Centrino mobile technology. Intel is a supplier of notebook components and does not manufacture or sell complete notebook systems. The information and software provided here are for Linux systems with Kernels 2.6.13 or greater. Please refer to your manufacturer for information specific to your notebook computer. The development site is available at http://ipw2200.sourceforge.net/. I need a wireless driver for my laptop,OS is ubuntu 12.10,I have the Intel Pro2200bg card ,ubuntu is linux based will your drive here work.